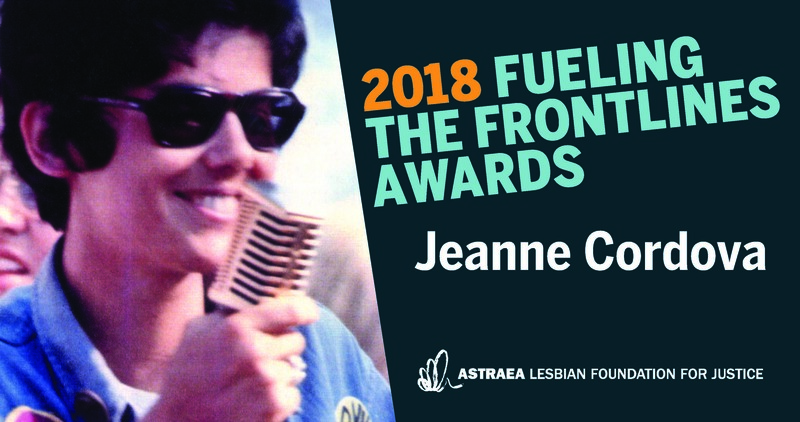 Astraea is thrilled to announce that we will be honoring Jeanne Córdova at our 2018 Fueling the Frontlines Awards on November 8th in Los Angeles. Jeanne was committed to helping sustain the movements that supported her as a young Chicana-lesbian activist. Before Córdova passed away in early 2016, she proclaimed, “It is wonderful to have had a life’s cause: freedom and dignity for lesbians,” and announced that her estate would donate $2 million to Astraea to carry out just that goal. “We need to think about giving to our gay and lesbian youth and institutions like Astraea or other lesbian organizations. They’re the ones who are nurturing our real daughters right now, around the world,” Córdova wrote in her final letter announcing the donation. In 2017, the Jeanne R. Córdova Fund supported 14 powerful grassroots organizations in South/Latin America and Southern Africa that focus on movement-building, human rights, journalism and cultural activism among lesbians, feminists, butch and masculine and gender nonconforming communities. Jeanne created so much more than a considerable legacy with her intentional bequest — she created decades of possibility — for Astraea, for our movements, and for our people. Jeanne exemplifies the visionary philanthropy we celebrate and depend on every day. It is in this spirit that we both honor and celebrate Jeanne’s formidable life and legacy at our Fueling the Frontlines Gala on November 8th. Celebrate Jeanne Córdova with us on November 8th! Questions about our Fueling the Frontlines Gala? For more information, contact Sally Troncoso at 212.810.4155 or stroncoso@astraeafoundation.org. Today, the Williams Institute, as part of the LGBTI Global Development Partnership has released three new research reports detailing the average levels of acceptance for LGBT people around the world. 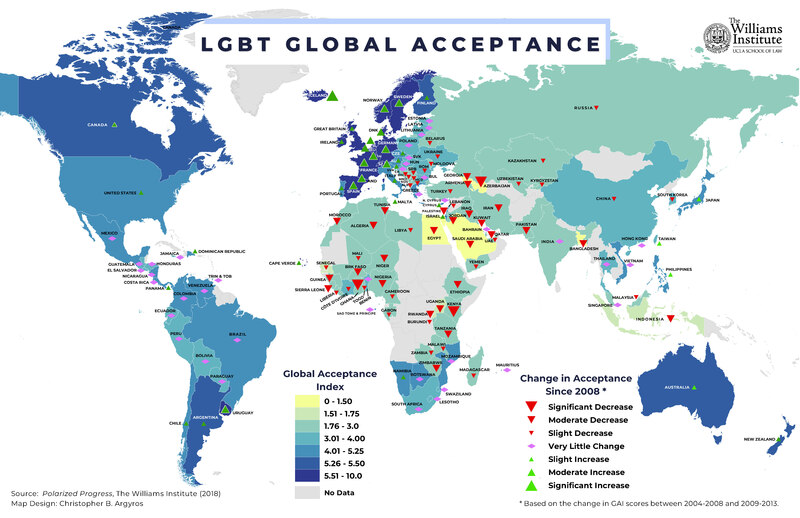 Today, the Williams Institute, as part of the LGBTI Global Development Partnership has released three new research reports detailing the average levels of acceptance for LGBT people around the world. The findings reveal that LGBT rights have increased globally since 1980, though acceptance has become more polarized; increasing in the most accepting countries and decreasing in the least. The Global Acceptance Index ranked 141 countries on their relative level of social acceptance of LGBT people and rights. Findings were analyzed from 11 cross-national, global and regional surveys and reveal that 80 countries (57%) experienced increases in acceptance. Forty-six countries (33%) experienced a decline in acceptance and 15 countries (11%) were unchanged. “The Global Acceptance Index provides a consistent and comparable way to measure attitudes and attitude change, which could better understand inclusion of LGBT people in many areas of social, economic, and political life,” said lead author Andrew R. Flores, Visiting Scholar at the Williams Institute. A third study, Links between Economic Development and New Measures of LGBT Inclusion, affirmed previous findings that the inclusion of LGBT people is linked to a country’s economic performance. Legal measures appear to be stronger predictors than social acceptance. Astraea is committed to supporting the LGBTQI grassroots organizations around the world who are working to reduce violence and discrimination, and bring lasting social justice to our communities. Note: These reports were produced as part of the Lesbian, Gay, Bisexual, Transgender, and Intersex (LGBTI) Global Development Partnership. The Partnership was founded in 2012 and brings together the United States Agency for International Development (USAID), the Swedish International Development Cooperation Agency (Sida), the Arcus Foundation, the Astraea Lesbian Foundation for Justice, the National LGBT Chamber of Commerce, the Gay & Lesbian Victory Institute, the Williams Institute, the Swedish Federation for LGBTQ Rights (RFSL), and other corporate, non-profit, and non-governmental organization resource partners. We’re only days away from Astraea’s Fueling the Frontlines Awards in Los Angeles! On May 25th, 2017 at the Ace Museum, we will gather to celebrate the frontline voices who are leading the new era of #resistance: Patrisse Cullors, Jennicet Gutiérrez, Bruce Cohen, Jorge Ramos, and Paola Ramos. The night will also feature an exclusive performance from Octavia E. Butler’s Parable of the Sower: The Opera by Toshi Reagon and cast members, as co-authored by civil rights activist Bernice Johnson Reagon. 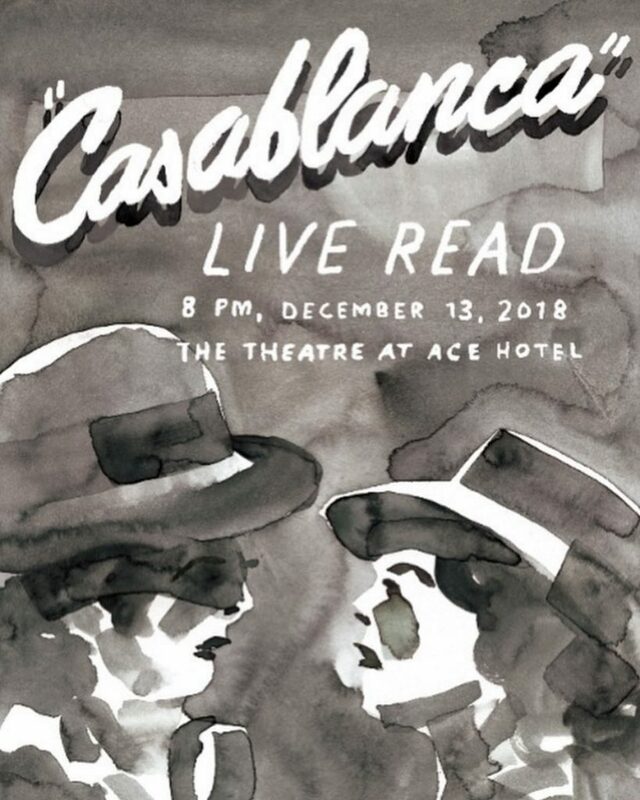 You won’t want to miss this bold and timely performance. A limited number of tickets are still available. Get yours now. 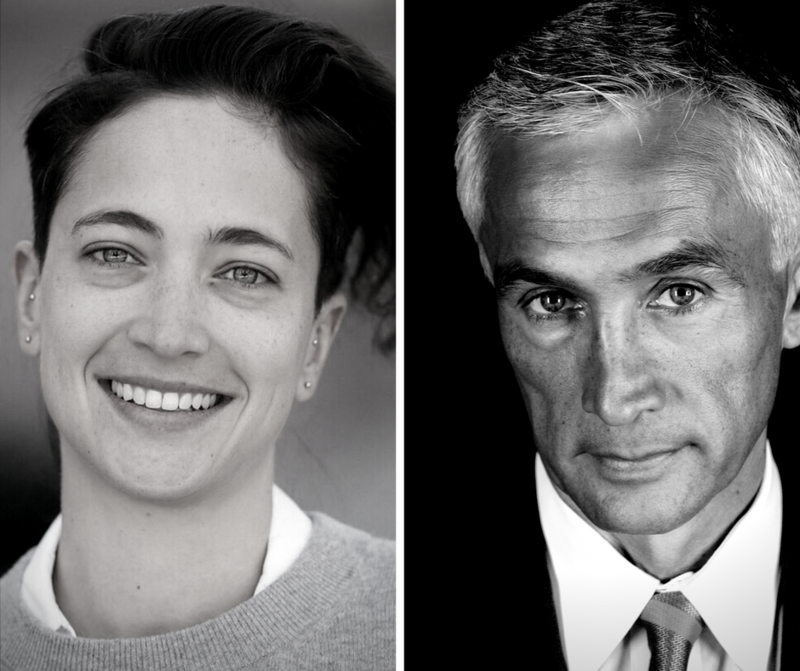 Today, we are pleased to introduce you to father and daughter Fueling honorees, Emmy Award-winning journalist Jorge Ramos and Latinx public servant Paola Ramos. Together, Jorge and Paola have over 45 years’ experience in elevating the narratives and championing the issues important to queer Latinos and their allies across the United States. Seasoned newscaster Jorge Ramos has documented five wars, covered the fall of the Berlin Wall, and interviewed countless world leaders. Ramos’ in-depth reporting and forthright commentary on human rights, immigration, white supremacy, and other issues that directly impact our communities is his invaluable contribution to the resistance. After being physically removed from a press conference in 2015 by asking how the then-hopeful Trump administration planned to deport 11 million undocumented immigrants, Ramos did not cease asking the hard questions: instead, he went directly to the source, creating the documentary Hate Rising, an expose on the rise of the Ku Klux Klan, Neo Nazis, and other emboldened hate groups in the United States. “Discrimination is still present in this country. We need organizations like Astraea to make sure that the rights of everyone are being protected,” Ramos tells us. Sharing her father’s vision for a just world, New York City Council spokesperson PaolaRamos works to protect human rights by fighting for the sanctuary and equity of immigrants in the five boroughs. A fierce believer in her communities, Ramos previously served as Deputy Director of Hispanic Media for Hillary Clinton’s 2017 President Campaign, where her efforts ensured that Secretary Clinton maintained an open dialogue with Latino and immigrant communities across the country. “We have Dreamers knocking on doors which never have before. We see Latinos lining up with their grandmothers and their cousins. It’s our job to capture those positive stories and to keep it going,” she urges. Join us in honoring Jorge and Paola Ramos for their tireless commitment to migrant rights on May 25th. Unable to attend the Awards? Still want to celebrate the intrepid spirits of grassroots activists? Donate a ticket so that a community member can attend this inspiring event. To learn more, please contact Loran Hamilton at lhwarner@astraeafoundation.org. We are nearly a week away from Astraea’s Fueling the Frontlines Awards in sunny Los Angeles, California! On May 25th, 2017 at the Ace Museum, Astraea will honor the frontline activists who are leading the new era of #resistance: Patrisse Cullors, Jennicet Gutiérrez, Bruce Cohen, Jorge Ramos, and Paola Ramos. The night will also feature a special ensemble performance from Octavia E. Butler’s Parable of the Sower: The Opera, co-authored by Bernice Johnson Reagon and Toshi Reagon––a production that was made for times like these! Have you made plans to spend a memorable evening with us? If not, a limited number of tickets are still available. Get yours today. Today, we excited to introduce you to 2017 Fueling the Frontlines honoree Bruce Cohen, who passionately believes in the intimate stories behind our queer liberation. Academy Award-winning producer Bruce Cohen is renowned in Hollywood for producing nuanced films about everyday people, including our LGBTQI movement forbearers. In addition to an Academy Award win for American Beauty in 2000, Bruce was nominated in 2009 for his work on Milk and again in 2013 for Silver Linings Playbook. Milk, directed by Gus Van Sant and written by Dustin Lance Black, tells the story of Harvey Milk, the celebrated gay rights activist who became the first out elected official in California, thus paving the way for queer civil servants across the country. In 2017, Bruce once more teamed up with Black on Black’s creation When We Rise, an epic television miniseries that tells the story of the first forty years of queer movement building in the United States. 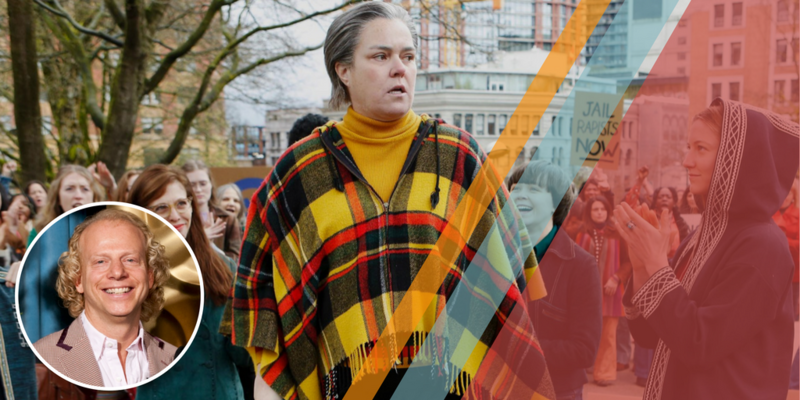 From Cleve Jones and Roma Guy to the Daughters of Bilitis and ACT UP, our community’s history is dramatized in six episodes that are masterfully staged by some of the greatest LGBTQI directors––including Astraea grantee partner Dee Rees (Pariah, Bessie) and Van Sant. Join us in honoring Bruce for his commitment to queer artistic collaboration and his championing of on-screen resistance on May 25th. Have you made plans to attend this year’s Fueling the Frontlines Awards yet? Please join us on May 25, 2017 at the Ace Museum in Los Angeles as we honor the frontline activists leading the new era of #resistance: Patrisse Cullors, Jennicet Gutiérrez, Jorge Ramos, and Paola Ramos. We are organizing at the moment to mobilize our communities because the new administration came out heavily attaching the immigrant community. We want to make sure we have a plan in place to protect and defend. Tickets are selling quickly; get yours soon. 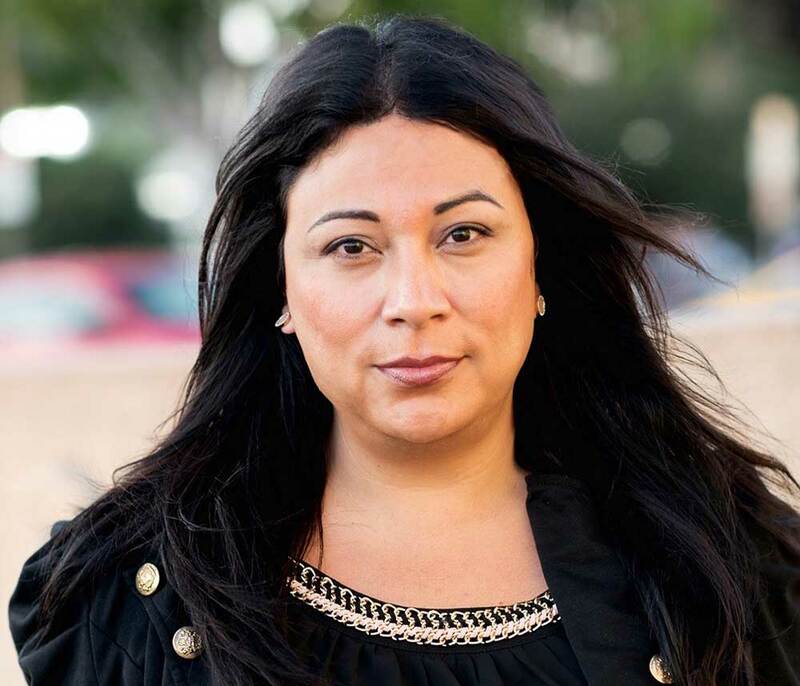 Today, we are excited to profile translatina activist and 2017 Fueling the Frontlines honoree Jennicet Gutiérrez. Jennicet believes that her struggle for liberation began with her birth in Tuxpan, Jalisco, México, which was unaided by a midwife. In the three decades since then, she’s fearlessly advocated for her fellow trans people of color. An organizer with Los Angeles-based Astraea grantee partner Familia: Trans Queer Liberation Movement, Jennicet works to end the deportation, incarceration, and criminalization of immigrants and all Brown and Black folks. 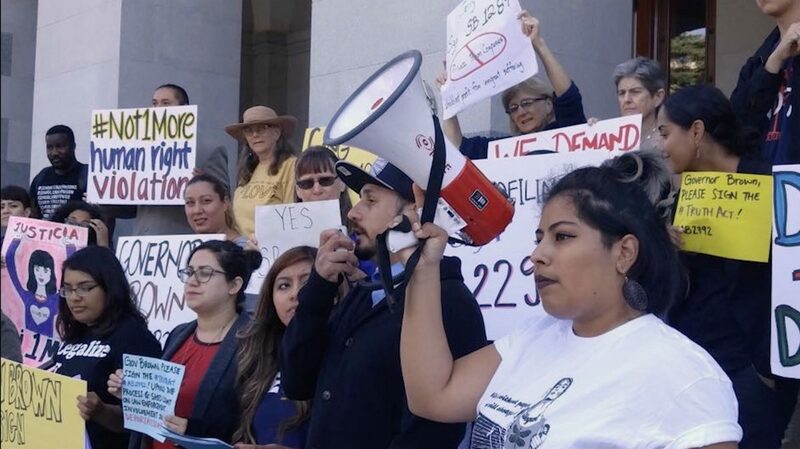 Recently, Familia has successfully campaigned to terminate Santa Ana County Jail’s contract with ICE (Immigrations and Customs Enforcement), thus ending the inhumane detainment of immigrants. 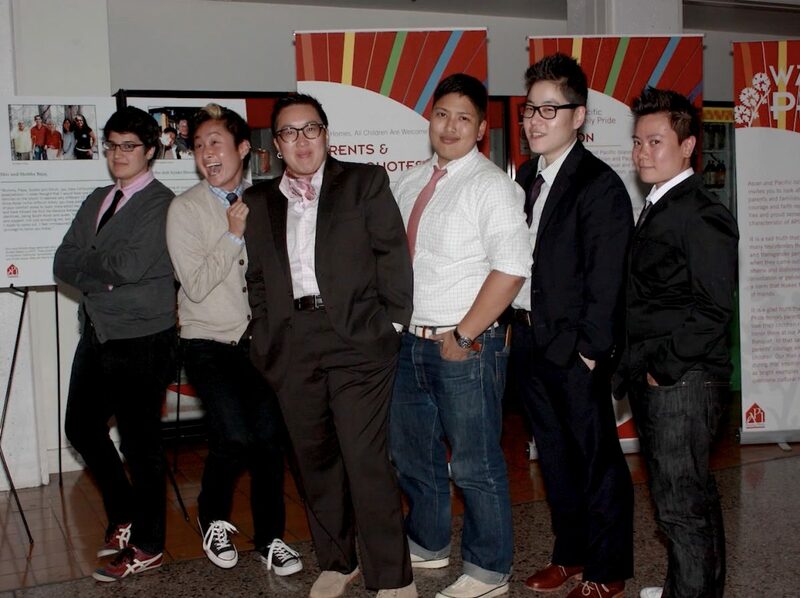 In June 2015, Jennicet received national media attention and created a critically important platform for undocumented LGBTQI people when she bravely interrupted President Barack Obama’s LGBT Pride Month Reception speech to draw attention to the growing numbers of LGBTQ people being forcefully held by the United States. “I spoke out to demand respect and acknowledgement of our gender expression and the release of the estimated 75 transgender immigrants in detention right now. There is no pride in how LGBTQ immigrants are treated in this country and there can be no celebration with an administration that has the ability to keep us detained and in danger or release us to freedom,” she wrote in the Washington Blade the next day. Currently, Jennicet and Familia are tirelessly working to end the deportation of Valeria de la Luz, an undocumented transwoman, through the #FreeValeria campaign. Proceeds from Fueling the Frontlines benefit LGBTQI grassroots activists like Jennicet who are doing brave and bold work in the United States and around the world. 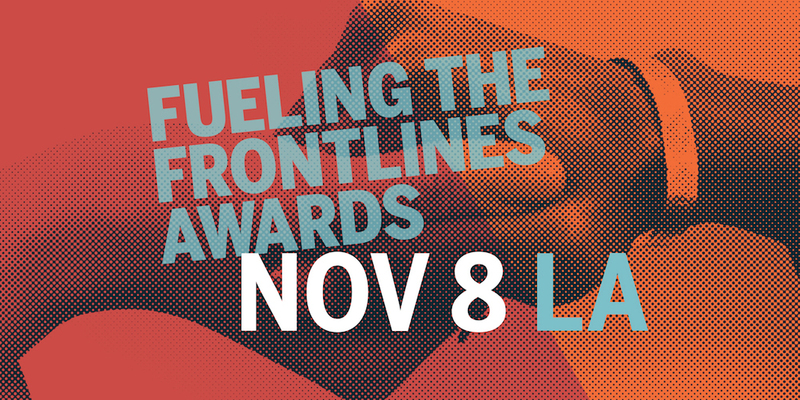 We are nearly a month away from this year’s Fueling the Frontlines Awards at Los Angeles’ Ace Museum! On May 25, from 6:30 to 9:30 pm, Astraea will honor the frontline activists and cultural changemakers who are leading the new era of #resistance, including PatrisseCullors, Jennicet Gutiérrez, Jorge Ramos, and Paola Ramos. 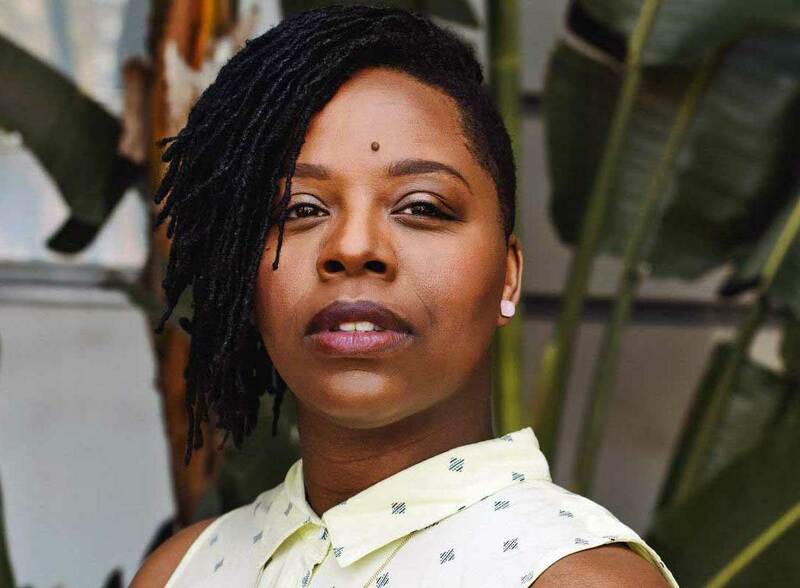 This week, we are honored to profile 2017 Fueling the Frontlines honoree and Black Lives Matter co-founder Patrisse Cullors. Ten years later, Patrisse created the organization Dignity and Power Now, which pursued and won civilian oversight of the Los Angeles Sheriff’s Department––a victory that brought justice to her family while protecting countless others. In 2013, Patrisse, with Alicia Garza and Opal Tometi, co-founded Black Lives Matter as a response to the enraging aquittal of George Zimmerman in the shooting death of Trayvon Martin. What began as a hashtag soon became an urgent call to action against police brutality and criminalization in the United States. Black Lives Matter has since expanded into an intricate network of 30 local chapters and thousands of determined activists fighting anti-Black racism worldwide. Patrisse has received many awards for her organizing and movement building, including being named a “Civil Rights Leader for the 21st Century” by The Los Angeles Times. Her memoir, When They Call You a Terrorist, is forthcoming from St. Martin’s Press. Support Patrisse and others like her who are during brave and imperative work. Get your tickets to Fueling the Frontlines today. Unable to attand the Awards? Still want to celebrate the intrepid spirits of grassroots activists? Donate a ticket so that a community member can attend this inspiring event. To learn more, please contact Loran Hamilton at lhwarner@astraeafoundation.org.